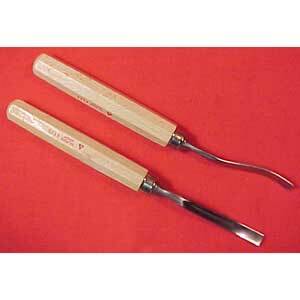 Wood Carving Chisels - These professional quality wood carving tools are made in Solingen, Germany. They come with forged and tempered igh carbon steel blades, pre-sharpened, but should be final honed by the artisans. The octagional, hardwood handle is 4-1/2" long, overall length is about 8". The wide variety of blade designs make them suitable for many carving jobs. These are hand tools, not meant to be used with a mallet. Solingen 8mm bent, spoon chisel. Made in Germany.